Electric Warrior wrote: I tried trimmers and decided I don't need any more options to mess up something that works perfectly fine the way it was designed. But then again I was lucky enough to score a handful of OC75s. All they need is a little swapping transistors around to make it behave nicely. Getting the voltages out of the range reported in vintage units is not easy with these. Lol. I hear ya brother. I always use whatever transistors I can get me grubby little paws on so i need those trimmers. did Small Bear instructions tell you 4.5V? I know with my mkII's I have one with OC75s and the other has OC84s - the 84s are so forgiving and those bias up great with no issues, but for my OC75s I had to use a trimmer on Q2c to get the voltages right with the 8.2k resistor on Q3c and swapping them around like EW says. Was a pain to get it to sound how I like it but that OC75 pedal is a beast! OC84 version to me seems smoother but both are great! That's a huge spread of hfes. When I have measurements at hand I just pick three transistors that are in roughly the same ballpark and take it from there. OC75s usually aren't that unforgiving. But you have one of those small bear sets with the huge spread of gains as well... With such a limited choice of transistors a trim pot sure can make your life easier. I was quite surprised to see I picked the lowest gain one for Q2. In the past I've ended up with the highest gain one in that spot frequently. But it's hard to generalize anyway. You mustn't take only hfe into account. Leakage plays a role as well, so you have six variables to play with. Rather complicated, so I just use whatever sounds good. But that doesn't tell us much without the leakage readings - other than the OC75s in that particular unit were rather high gain. But I feel that doesn't make all that much of a difference, anyway. It's not about absolute hfe readings but more about how hfes and leakages interact with each other. And there's more than one way that works, I can assure you that. I believe fuzzcentral recommends something like 70-70-100 and getting Q3C down to -4.5V. It's not a reliable source for MKII info. The OC81D circuit on top of the page is correct. The other two vintage circuits both have issues. I have a vintage unit, but I'm not willing to unsolder the transistors. I can get in the right tonal ballpark without knowing the exact hfes or leakages. They're not all that rare, really. But most you'll find on ebay are overpriced. I was lucky with the Valvo AC125s I mentioned. I tried to get more, but I only ended up with some Philips that don't leak quite enough... oh well. I'll find a use for them. Maybe you can try Tungsrams? They're cheap, available and some leak a lot I hear. No idea how they sound, though. They're probably great. But way too expensive. Personally I wouldn't pay more than $4 for an OC75..
Electric Warrior wrote: They're probably great. But way too expensive. Personally I wouldn't pay more than $4 for an OC75..
i have leave everything stock, Q1 10k and -8.2V. Q2 47K and -0.32v and Q3 8.2k and -6.45V power supply at -9.36v, its 12:20 am so i cant tray it out but tomorow i will post the results of leaving stock everything, if i could get the right spot on voltages could it be fine, also i have seen taht there 2 kits on small bear that are OC75 mullards, but without the gain spot on it, but the are pretty cool i will try buy the monday if no-one else does first. I recently got out the only smallbear set i ever bought, some texas instruments 2g308 on q1, 2g303 on q2, and 2g308 again on q3..this set costed more than the oc75 set he was offering at the time (more than one year ago). After a few successful builds, i must say that set sounds great, even though i didnt comply with the resistor value he sent me on paper, and kept it stock.and guess what, it sounds very much like the oc75 builds. If youre a newbie, or have unsuccessful builds, my advice is to buy a tested set, and use stock values.. Or smallbears attached handbill that suits their measurements for the set..
Then experiment using it as a template against other builds. 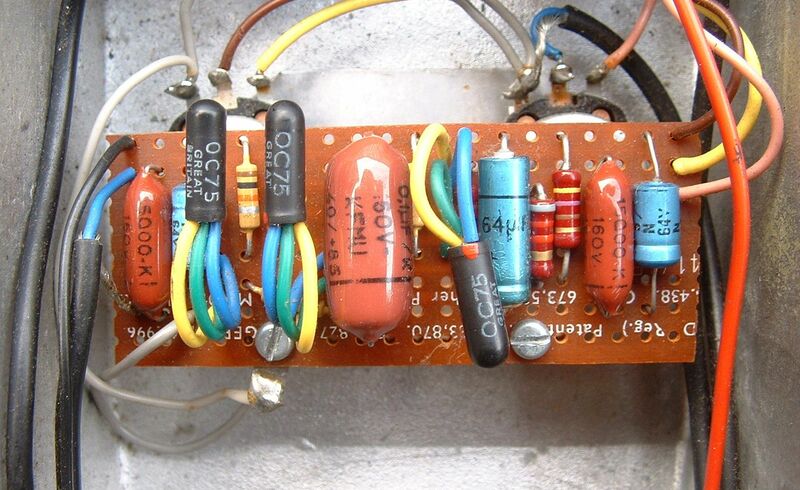 I am still deep in the transistor swapping swamp with my oc70, oc74, oc77, oc79 valvos..bear with me. Talking about expensive stuff, I lost an auction for 5 yellow jacket oc44s: i think it ended at round 50 pounds. I can vouch for the cheap and readily available Tungsram AC125s - really decent. Closer to OC75s than OC84s, just a touch noisier than either with the Attack at max. I find they don't need to be quite as leaky as EW's Valvos. Putting the lowest leakage in Q2 helps it to bias properly with the stock 47k resistor. I have a bag of Philips AC125s that are more in the 3-500uA range that I couldn't really use - maybe I should dig 'em out and have another go. I did get a set of Philips OC75s off SmallBear about 3 years back. They were well matched and sounded great, no messing about required. Gains were 80-100 and all leaked about 350uA IIRC. The Sola Sound OC84 reissue that I have has 15nF caps in place of the 10s to compensate for drift. That's pretty important - sounds much more like a vintage unit if you do that (more mids, a little smoother up top, and just generally better). Up to 22nF on the output cap still sounds good with the Tungsrams. Another thing to note about the Tungsrams - some are marked "HM" on the top and on the packet. These are consistently lower leakage and gain than ones that aren't marked "HM" and work well in the mk ii. I've had a look at the Tungsram catalogue, but I don't see any mention of that. I was listening to Led Zep I after ages, having bought the new remaster the other day.. at 00.30 before the end of You Shook Me you can hear the sustained note, having a pretty bad oscillation. Yes, could be anything.. but got me wonderin.. most of my tone benders oscillate in one way or another.. even subtly.. What do you pros say? Also, on You Shook Me, to my ears the main riff (two guitars? With vocal underneath? Some breathy stuff goin on but could be the hissy fuzz) from hell, sounds a lot like a (Ronno harp like half coked wah tone) mk i! Can you guys dig it? Have you read the "Page fuzz" thread at the D*A*M forum? There is masses of discussion of page's fuzz tones, You Shook Me features heavily.